SILJE NORENDAL WINS THE 3STAR RIP CURL SISTA SESSIONS 2011 SLOPESTYLE AND ANA RUMIHA THE BURN RAIL JAM. Mayrhofen, 27th January 2011. Last week (19th-23rd January) saw the TTR 3Star Rip Curl Sista Sessions 2011 hit Mayrhofen, Austria in force, with an entourage of female shredders, media, judges, filmers and photographers. Over five crispy cold January days the resort saw pro ladies going on photoshoots, beginners chicks have freestyle lessons, and the amateurs and invited girls battle it out in a friendly format 3Star Swatch TTR Slopestyle and Rail Jam competition. The 3000€ prize purse had attracted an international parade of girls and the park filled up on Friday with over 35 riders in the Slopestyle qualifiers and 39 in the Rail Jam qualifiers. Silje Norendal from Norway took the Slopestyle title, while Croatian Ana Rumiha took top honours in the Burn Rail Session. Best Trick went to last year’s winner Urška Pribošič (SLO) for her lofty and stylish Switch Backside 540. The crowd saw some seriously impressive riding go down, with Front Bluntslides, Frontside & Backside Rodeos and frontside 720s all showing up on the trick list. 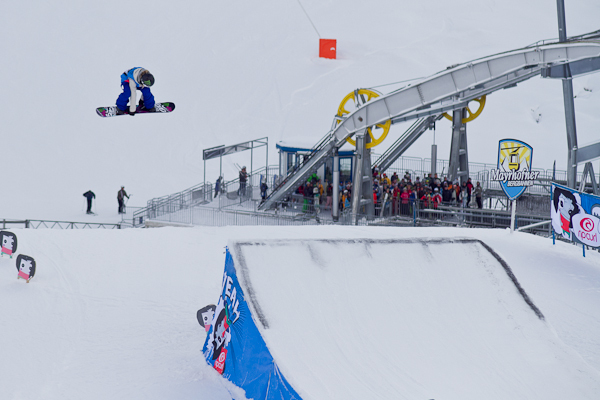 The infamous Vans Penken Park shaped by QParks in Mayrhofen was in impeccable shape and the 4-feature slopestyle course was the perfect size, allowing the girls to try their most progressive moves. Saturday 22nd saw the finals of the Rip Curl Sista Sessions kick off in style. Ten girls had made it through to the semi-finals, but due to early fog and difficult visibility the organizers, judges and riders agreed to change the format, moving all riders into one final with 4 runs while keeping the best-run-counts format. This format let the girls take risks knowing they only had to nail it once. The anticipation was pumping throughout the day, as John Weaver kept everyone in great spirits even during the occasional snowy spell. Rip Curl Sista Sessions wrapped up with Silje Norendal (NOR) on the top of the Slopestyle podium, after throwing down an awesome run: frontside lipslide to fakie, switch 50-50 to switch frontboard, switch back 180 indy grab, and sealing the deal with a front rodeo 540. The stoked Silje, who stomped all four of her runs, said “I think it’s really important to have a girls event like this. Have lots of girls together and just ride and have fun.” Local shredder Tini Gruber came in a close second with her huge and smooth backside 540s and perfect frontside 360s. Placing third, Elena Kötz pleased the crowds with a backflip and solid frontide 540s. 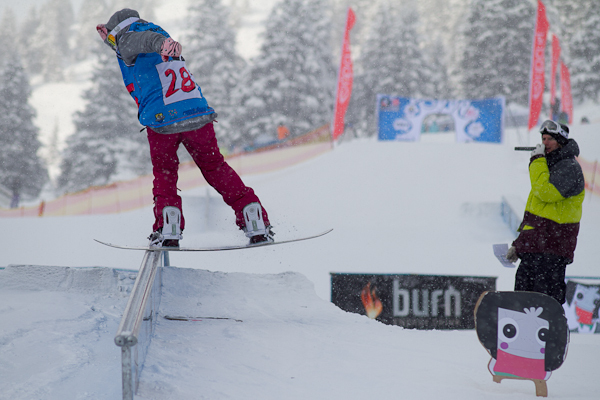 The chilled rail jam format allowed the girls to bring their A-game to the table, while having fun. Out of the 39 Girls in the Friday qualifications, 12 girls went through to the Burn Rail Jam Session finals on Saturday. In the final, Croatian Ana Rumiha destroyed the rail session. Riding with legit style and a technical level that most guys can’t match, wrapping things up with a Frontside Blunt to boardslide revert. 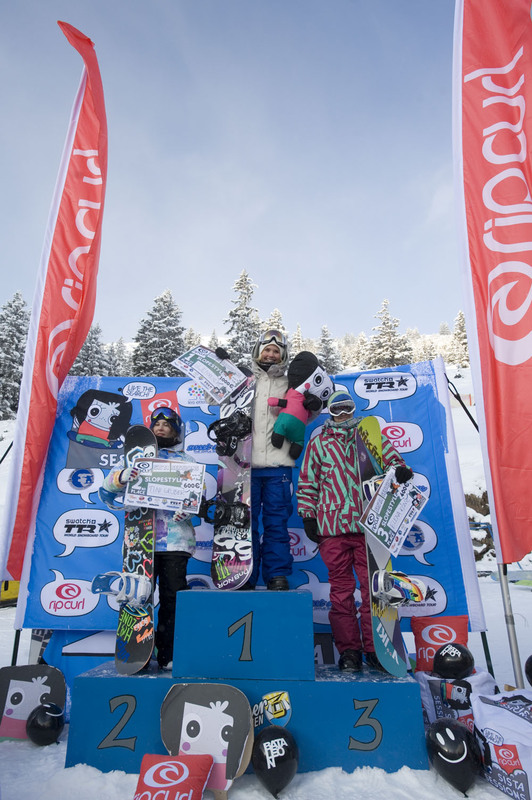 In second place, Urška Pribošič rocked some true nose-presses with serious style, while local Anna Gasser took third place with a Frontside Board Pretzel. South West of France with Surf Affinity, an all girls surf camp. The prize winner, Urška Pribošič will be tanning herself on the beach this summer after laying down one of the biggest switch backside 540 out there, only 4 days after learning them. The Best Non-Sponsored Rider prize went to My Svensson from Sweden, who won the one-year sponsorship 2011/12 with Rip Curl. Sweet Dream, GummiLove and Golden Ride Magazine provided loads of prizes for the Beginner Box Jam Session, and with the SMT Snowboard teachers on hand, beginner freestylers received free coaching throughout the week. With the smell of fresh toasties floating around the park, people relaxed in deckchairs drinking Burn energy drink, tested Bataleon boards, smelt like Les Ettes and ate cookies baked by ex-pro Silvi Schlereth, who also sat on the judging panel. The fun didn’t stop there and the event continued with the Rip Curl Sista Sessions afterparty at the Gasthof Zillertal bar, where the crowds rocked out to the sounds of UK DJ Dr. Fish on the decks. Judge Jason Horton commented on the event: “With the Chicken Jam and the Chickita both done and gone, the Sista Sessions has quickly evolved from a cool little gathering of friends to the main attraction in European women’s snowboarding. While this is a good thing, what is even better is how they keep the vibe as it was from the start: fun, friendly and open to all.” The Rip Curl Sista Sessions also encourage the Ticket To Ride structure and there where several invites handed to the winners and other riders for some of the top European girls snowboard events, the 3Star Swatch TTR Catfight by Battery in Levi, Finland and the 2Star Ladies First Challenge Final in Thyon, Switzerland, as well as, the 3Star Shred Down Austrian Masters. Thanks to our supportive sponsors and all who came along, rode, shaped, judged, filmed, helped out or got involved! SEE YOU NEXT YEAR! Check out the photos on http://www.sistasessions.com <http://www.sistasessions.com&gt;, plus videos coming soon!